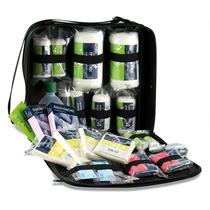 Designed for major incidents and emergencies. The bag opens like a shell to expose the miriad of loops and straps that hold each individual item in place. It allows clear identification and access to a wide range of components, ideal for emergency use. 37cmH x 37cmW x 9cmD.